This is the time of year when you can divide your rhubarb crowns. It is a good thing to do to your rhubarb anyway about every 5 years or so. The crowns can get a bit overcrowded and lacking in vigour. Just dig up the dormant crowns at this time of year and slice them into pieces of about 4 or 5" across, making sure you have a bud at the top of each. Re-plant these crowns with plenty of well rotted manure. 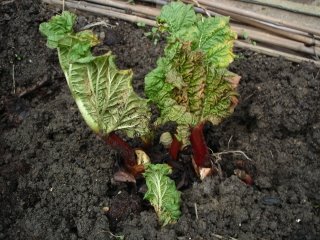 Most people put manure on their rhubarb, I do not.... I prefer custard! Many thanks to Scarecrow who emailed me last week to let me know that my veggie blog was included in a 'Top of the Blogs' feature in The Grauniad last week. Thanks must also go to my blog readers who inspire me every day. When I started this blog I really didn't think I had much to say! !